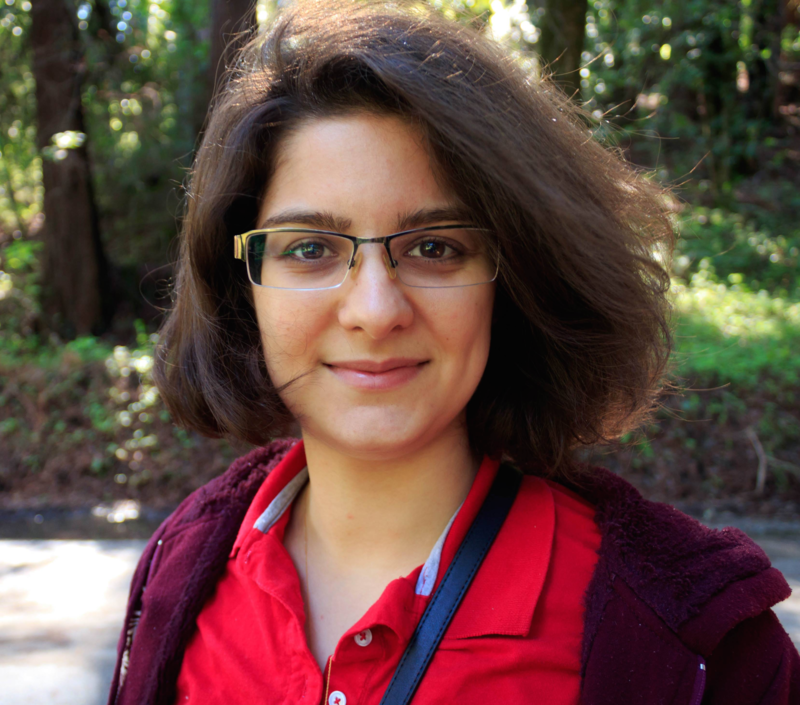 I am a fourth year PhD student in the Human-Computer Interaction Institute (HCII) at Carnegie Mellon University (CMU). I am advised by Dr. Amy Ogan. Currently, I am working on ClassInSight, a project that aims to use Personal Informatics to support and improve teaching at the university level. Check my Publications for my latest work! Prior to CMU, I have completed my undergraduate studies at Lafayette College, where I majored in Computer Science and minored in Mathematics. Although learning with Intelligent Tutoring Systems (ITS) has been well studied, little research has investigated what role teachers can play, if empowered with data. Many ITSs provide student performance reports, but they often are not designed to support teachers and their practices. A dashboard with analytics about students’ learning processes might help in this regard. Little research has investigated how dashboards influence teacher practices in the classroom and whether they can help improve student learning. In this project, through a variety of user-centered design methods, we initially investigated what student data is most helpful to teachers and how teachers use data to adjust and individualize instruction. We then explored through a quasi-experimental classroom study how Luna, a dashboard prototype designed for an ITS and used with real data, affects teachers and students. Red black trees are an important data structure with many applications. However, they are quite difficult for the students to learn and master due to the complexity of the rules and concepts involved. 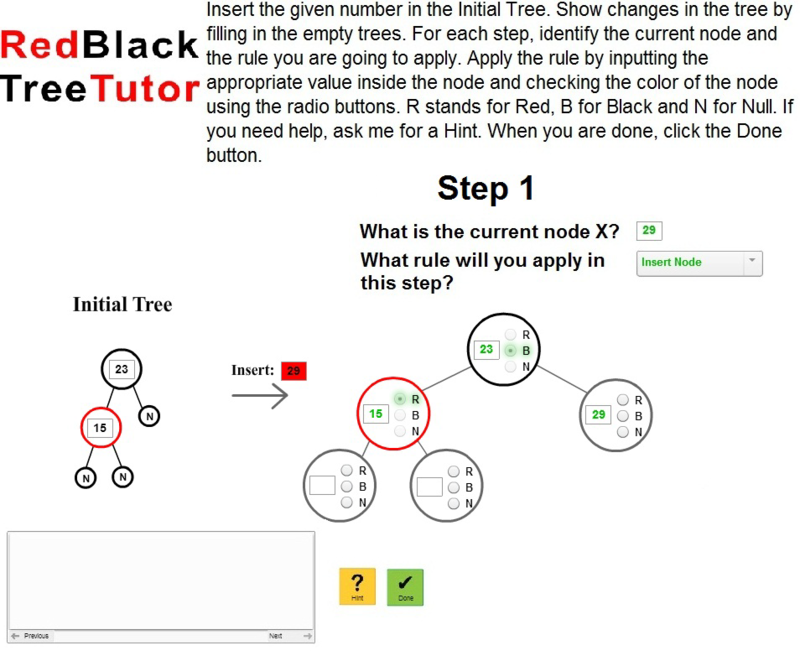 I explored the process of designing, developing and evaluating an Intelligent Tutoring System, the RedBlackTree Tutor, that aims to help students learn and practice the top-down insertion algorithm in red black trees. The RedBlackTree Tutor has been experimentally tested and evaluated in the CS 150 Data Structures and Algorithms course at Lafayette College during the Fall 2014 and Spring 2015 semesters. The results of employing the intelligent tutor in teaching top-down insertion in red black trees show significant learning gains by students. Xhakaj, F., Aleven, V. (2018). Towards Improving Introductory Computer Programming with an ITS for Conceptual Learning. In International Conference on Artificial Intelligence in Education (pp. 535-538). Springer, Cham. Bodily, R., Kay, J., Aleven, V., Davis, D., Jivet, I., Xhakaj, F. & Verbert, K. (2018). Open learner models and learning analytics dashboards: A systematic review. In Proceedings of the 8th International Conference on Learning Analytics and Knowledge (LAK), pp. 41-50. ACM, 2018. Xhakaj, F., Aleven, V., McLaren, B.M. (2017). Effects of a Teacher Dashboard for an Intelligent Tutoring System on Teacher Knowledge, Lesson Planning, Lessons and Student Learning. In É Lavoué, H. Drachsler, K. Verbert, J. Broisin, M. Pérez-Sanagustín (Eds. ), Proceedings of the 12th European Conference on Technology Enhanced Learning, EC-TEL 2017, (pp. 315-329). Springer International Publishing Switzerland. Xhakaj, F., Aleven, V., McLaren, B.M. (2017). Effects of a dashboard for an intelligent tutoring system on teacher knowledge, lesson plans and class sessions. In E. Andre, R. Baker, X. Hu, Ma. M. T. Rodrigo, B. du Boulay (Eds. ), Proceedings of the 18th International Conference on Artificial Intelligence in Education, AIED 2017, (pp. 582-585). Springer International. Xhakaj, F., Aleven, V., McLaren, B.M. (2016). How teachers use data to help students learn: Contextual Inquiry for the design of a dashboard. In K. Verbert, M. Sharples, T. Klobučar (Eds. ), Proceedings of the 11th European Conference on Technology Enhanced Learning, EC-TEL 2016, (pp. 340-354). Springer International Publishing Switzerland. Aleven, V., Sewall, J., Popescu, O., Xhakaj, F., Chand, D., Baker, R. S., & Gasevic, D. (2015). The beginning of a beautiful friendship? 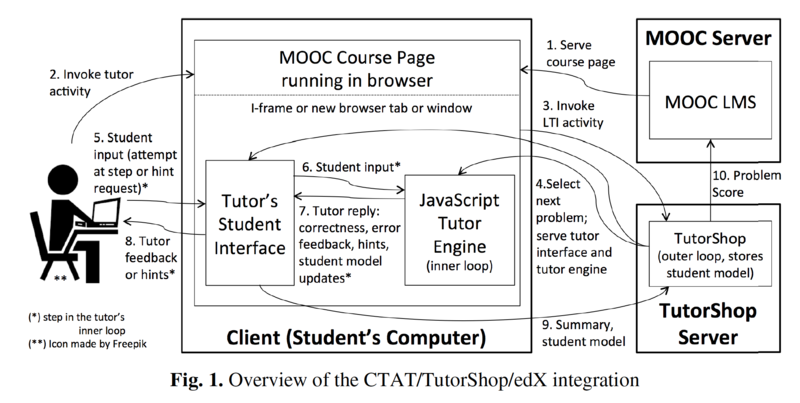 Intelligent tutoring systems and MOOCs. In C. Conati, N. Heffernan, A. Mitrovic, & M. F. Verdejo (Eds. ), Proceedings of the 17th International Conference on AI in Education, AIED 2015 (pp. 525–528). New York: Springer. Liew, C. W., & Xhakaj, F. (2015). Teaching a complex process: Insertion in Red Black Trees. In C. Conati, N. Heffernan, A. Mitrovic, & M. F. Verdejo (Eds. ), Proceedings of the 17th International Conference on Artificial Intelligence in Education, AIED 2015 (pp. 698–701). New York: Springer International Publishing. Xhakaj, F., & Liew, C. W. (2015). A new approach to teaching Red Black Trees. In V. Dagienė, C. Schulte, & T. Jevsikova (Eds. ), Proceedings of the 20th ACM Annual Conference on Innovation and Technology in Computer Science Education, ITiCSE ‘15 (pp. 278–283). New York: ACM. Aleven, V., Xhakaj, F., Holstein, K, & McLaren, B. M. (2016). Developing a teacher dashboard for use with intelligent tutoring systems. In Proceedings of the 4th International Workshop on Teaching Analytics at the 11th European Conference On Technology Enhanced Learning, IWTA 2016. Holstein, K., Xhakaj, F., Aleven, V., & McLaren, B. M. (2016). Luna: A dashboard for teachers using intelligent tutoring systems. In Proceedings of the 4th International Workshop on Teaching Analytics at the 11th European Conference On Technology Enhanced Learning, IWTA 2016. Xhakaj, F. (2015). Intelligent tutors and granularity: A new approach to Red Black Trees. Unpublished senior thesis, Department of Computer Science, Lafayette College, Easton, Pennsylvania. USA.